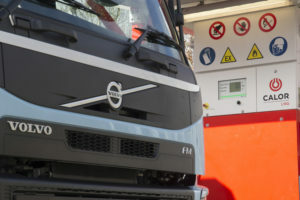 Volvo Trucks has begun shipping its new LNG-powered vehicle to the UK, using Calor’s facility at Donington Park for its first refuel. The Volvo FH LNG uses a gas-powered engine based on existing diesel technology, and while running on LNG the 460hp unit can deliver 20 percent less CO2 than the equivalent diesel FH truck. The Donington Park refuelling station is one of seven operated by Calor in the UK, and is conveniently accessed by the public and businesses alike from the M1 motorway. Martin Tomlinson, Head of Product Demonstration – UK & Ireland at Volvo Group Trucks, explained, “The development of our new FH LNG truck is the result of our commitment to transportation that is sustainable in the long term, through energy-efficient, competitive and future-proof solutions with a low climate and environmental impact. Mark Gilks, Transport Specialist at Calor, added, “The benefits of LNG for HGVs are clear. With leading truck manufacturers predicting that natural gas-powered vehicles could account for 20 per cent of HGVs sold by the early 2020s, the future opportunities for LNG are really exciting. “For long-haul HGVs, LNG is a low carbon, competitively-priced fuel solution with good availability. Our publicly accessible LNG refuelling network is the largest in the UK. As well as Donington, we operate stations in Lockerbie, Castleford in West Yorkshire, Lymm in Warrington, Grantham, Wolverhampton and Bristol. With plans to expand this network further already underway, we are committed to helping the industry towards a more sustainable future.